Prototype: German Federal Railroad (DB) class E 19 electric locomotive. In the blue paint scheme with older design headlights. The locomotive looks as it did around 1966 Road no. : E 19 01. Use: Express and fast passenger service. Model: Era III. The locomotive frame is constructed of die-cast metal. The locomotive has a 21-pin digital connector. It also has a 5-pole motor with a skewed armature and a flywheel, centrally mounted. 2 axles powered. The headlights are maintenance-free, warm white LEDs, and they will work in conventional operation. The locomotive has detailed roof equipment. The engineer's cabs have interior details and a figure of an engineer. The locomotive has NEM coupler pockets. The buffer beam details are included in a bag so that the front of the locomotive can be fully equipped for display or equipped for operation. Length over the buffers 194.5 mm / 7-11/16. 5-pole motor with a skewed armature and a flywheel for silky smooth running characteristics. Buffer beam can be fully equipped for display. Warm white LEDs for headlights, they change over with the direction of travel, the lights facing the train can be turned off in digital operation for prototypical operation. 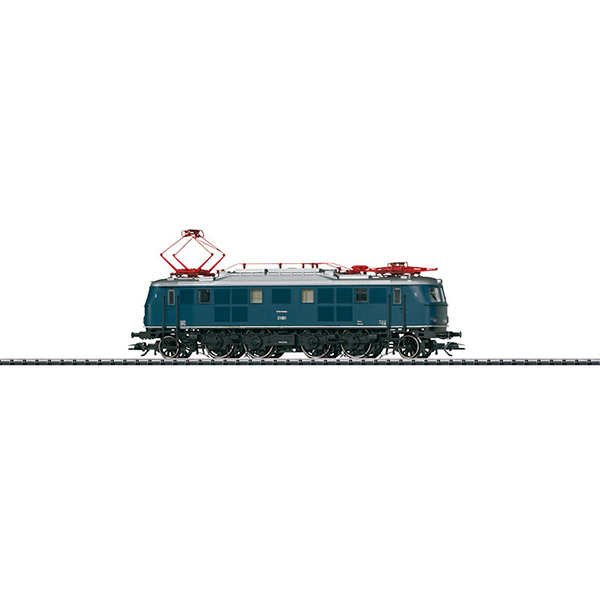 The Class E 19 - the Fast, Powerful Blue One! The German State Railroad Company preferred electric motive power more and more for express passenger service. In 1937, 2 each of the class E 19 locomotives were ordered from AEG and Siemens/Henschel. They were intended to serve the planned electric connection from Berlin to Munich via Halle. The maximum speed was planned for 180 km/h / 113 mph and 60 km/h / 38 mph had to be maintained with a fully loaded express train on the grades for the Frankenwaldbahn line. Both firms developed the locomotives on the basis of the proven E 18. Road number E 19 01 built by AEG was presented in 1938 and was placed in regular service after successful test runs. All four locomotives had the elegant red paint scheme that identified express locomotives, and the emblem of that time for the German State Railroad Company was ostentatiously present on the ends of the locomotives. The planned test runs at 225 km/h / 141 mph did not take place and the outbreak of World War II precluded further purchases of the E 19. After 1945, these powerful, fast locomotives remained in the West and the German Federal Railroad stationed them in Nurnberg, from where they ran as express locomotives to Regensburg and in Inter-zone service to Probstzella. The maximum speed was reduced to 140 km/h / 88 mph, the skirting at the ends was removed, and the paint scheme changed on some locomotives to the German Federal Railroad green in effect at that time and on others to the German Federal Railroad blue. The class 119 was the most powerful electric express locomotive on the German Federal Railroad until the class 103 was placed into service.